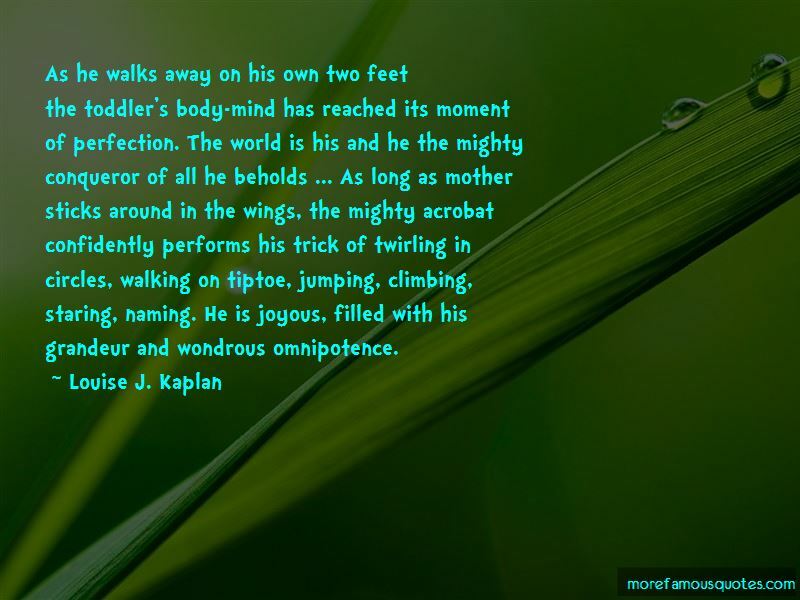 Enjoy the top 41 famous quotes, sayings and quotations by Louise J. Kaplan. in the liveliness of our innate growth energies, in the vitality of our stiffening-away muscles, in our looking eyes, our listening ears, our reaching-out hands. Another potentiality of our irrepressible juvenility is a capacity to maintain until the onset of senility an active creative interaction with our environment. We persist in exploring, investigating, inventing, discovering. In these respects humans of all eras, in all societies, all ages of life, are more like baby chimps and not at all like the sedate and rigidly conforming adult chimpanzee, who hasn't changed much since she was five or six years old. We belong to that order of mammals, the primates, distinguished by its propensity for repeated single litters, intense parental care, long life-spans, late sexual maturity, and a complex and extensive social existence ... Our protracted biological and psychological helplessness, which extends well into the third year of life, intensifies the bond between infant and parents, making possible a sense of generational continuity. In contrast to other primates these bonds are not obliterated after sexual maturity. so disillusions a youth about her parents as the seemingly inhumane way they treat her grandparents. What eleven- to thirteen-year-old boys fear is passivity of any kind. When they do act passively we can be fairly certain that it is an act of aggression designed to torment a parent or teacher ... Mischief at best, violence at worst is the boy's proclamation of masculinity. Adolescents are the bearers of cultural renewal, those cycles of generation and regeneration that link our limited individual destinies with the destiny of the species. The purpose of adolescence is to revise the past, not to obliterate it ... Adolescence entails the deployment of family passions to the passions and ideals that bind individuals to new family units, to their communities, to the species, to nature, to the cosmos. Therefore, given half a chance, the revolution at issue in adolescence becomes a revolution of transformation, not of annihilation. 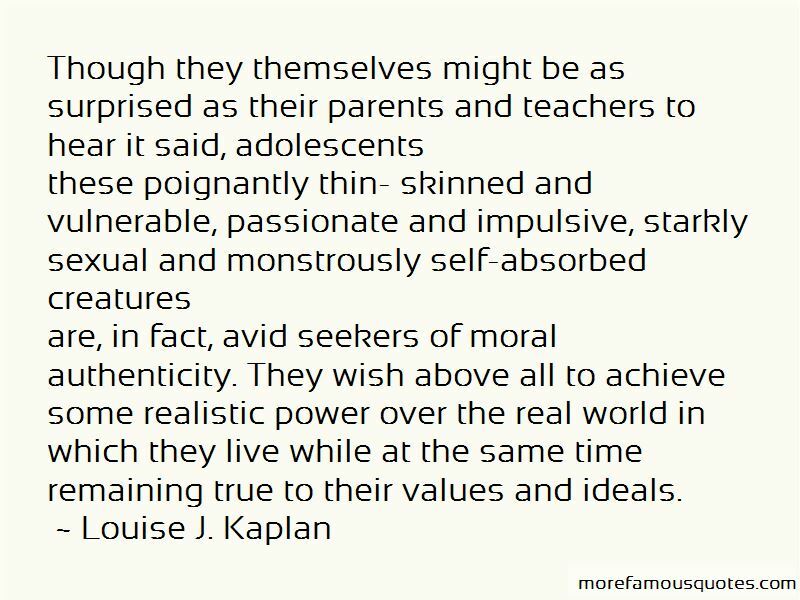 It is an odd fact that what we now know of the mental and emotional life of infants surpasses what we comprehend about adolescents ... That they do not confide in us is hardly surprising. They use wise discretion in disguising themselves with the caricatures we design for them. And unfortunately for us, as for them, too often adolescents retain the caricatured personalities they had merely meant to try on for size. During adolescence imagination is boundless. The urge toward self-perfection is at its peak. And with all their self- absorption and personalized dreams of glory, youth are in pursuit of something larger than personal passions, some values or ideals to which they might attach their imaginations. 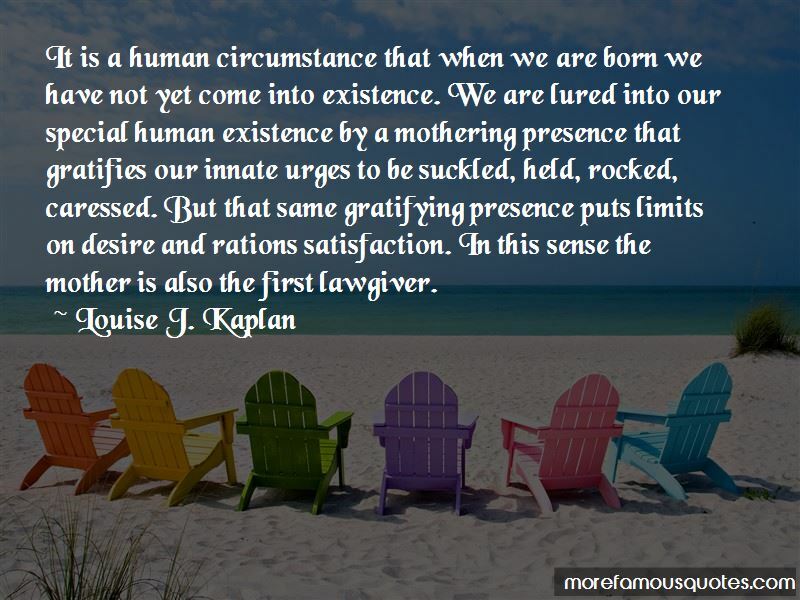 Want to see more pictures of Louise J. Kaplan quotes? 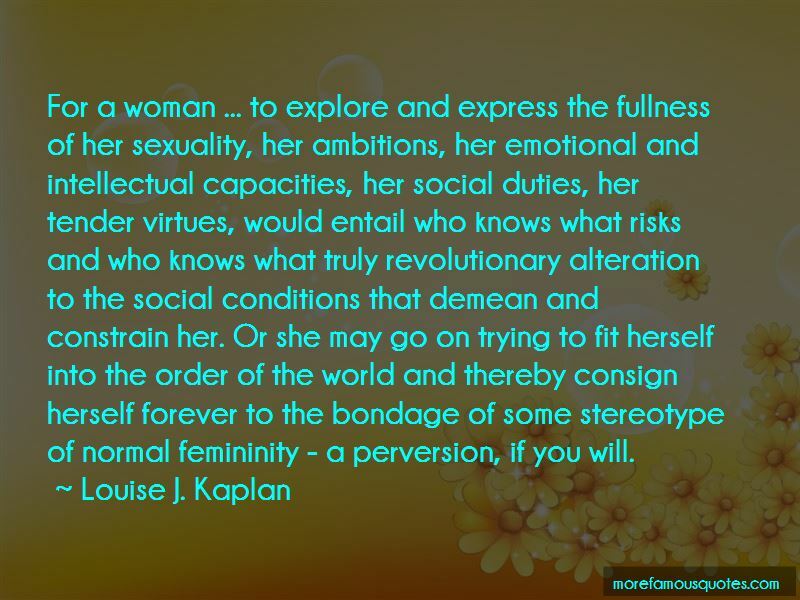 Click on image of Louise J. Kaplan quotes to view full size.